A Performa commission, in partnership with the Italian Cultural Institute. 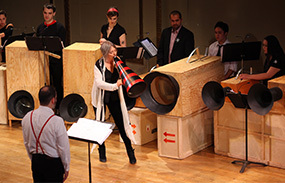 Luciano Chessa and the Orchestra of Futurist Noise Intoners present a full performance of extraordinary hand-cranked instruments, designed originally over a hundred years ago by Futurist Luigi Russolo and inspired by Leonardo da Vinci’s musical automata. ArtScience Late events are free.